I am part of a network of events that have occurred in the lives of many people, some of whom are unknown to me. I know that their deaths must have contributed to my life, and that without them I would not be who I am. To be aware of this is to carry their love within my heart, and to live in a spirit of gratitude. The Enneagram in Motion is a special 5-day intensive immersion and exploration of the enneagram led by Russ Hudsonand Deborah Rose Longo, with a special day of dialogue with Cynthia Bourgeault, held February 27- March 4, 2017 at Claymont Society for Continuous Education, 667 Huyett Rd., Charles Town, WV 25414. The intent for this time together is to hold a space for an "experiential tria-a-logue" between the enneagram of personality, the Gurdjieff enneagram of transformation, and a movements immersion in a Wisdom school container. This is a unique opportunity to explore the enneagram from a kinesthetic perspective, led by some of the foremost practitioners in the world today. The daily schedule will include morning exercise and/or silent meditation (alternating), a morning teaching session by Russ Hudson, followed by a movements class led by Deborah Rose Longo; practical work (mostly around getting lunch together, some gardening and work on the land), lunch; afternoon teaching by Russ, afternoon movements by Deborah, evening for discussion, reflection, observations, concluding with short silent meditation. Cynthia Bourgeault will come for a special day of co-teaching with Russ and Deborah. This movements intensive will explore the deeper kinesthetic dimensions implicit in the enneagram. Daily teaching by Russ Hudson will focus on an expanded understanding of the enneagram, and a special day of dialogue with Cynthia Bourgeault and Russ Hudson will deepen the growing connection between the enneagram of personality as currently understood and the enneagram of transformation as taught in the fourth-way work begun by Gurdjieff. The enneagram of transformation that Gurdjieff brought into Western culture was taught by movement and music, not just lecture. We all seek to deepen the work of transformation and presence in our own lives. But how do we get there? Many of us in the Western culture have an overuse of the intellectual and emotional centers and a neglect of the movement center. This kind of movements intensive is necessary corrective work for many of us. Some of the inner postures and stances that we seek to establish in ourselves, it turns out, are best taught (and caught) not via words, but through body posture, rhythm, music and movement. The sacred movements brought by Gurdjieff are powerful but little known tools for teaching presence and three centered knowing. Normally, these movements are not taught until after a student has been in a fourth way school for several years. This is a rare opportunity for those of us not formally engaged in the Gurdjieff Work to experience firsthand the transformative power of the sacred movements. The daily schedule will include approximately four hours a day on the movements floor. Though the movements do not require extraordinary fitness or athletic training, it is expected that participants will have a basic physical, mental, and emotional stamina to participate fully in the daily schedule as outlined above. The cost of the school is $695, and includes lodging and meals for five days at the Claymont Society in Charles Town, West Virginia. Registration for the school is by application only. Please fill out the Enneagram in Motion application form. Upon notification that you are accepted into the school, a deposit of $100 is required to hold your place in the school. The rest of the payment is due 30 days before the school begins. Your deposit and program fees are fully refundable up to two weeks before the event. Scholarships are available for those who need assistance. For more information e-mail Bob Sabath at Friends of Silence or phone him at 202-531-7572. Make out checks to Friends of Silence and send to Friends of Silence, c/o Enneagram in Motion, 120 Jubilee Lane, Harpers Ferry, WV 25425. Application form will soon be available. You can also make a deposit or a payment online. We want to make this event available to all those interested regardless of their financial means. Scholarships and payment plans are available. Contact Friends of Silence or Bob Sabath for more details. Russ Hudson, co-founder of the Enneagram Institute, is one of the principal scholars and innovative thinkers in the Enneagram world today. 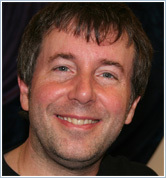 He is also the executive director of Enneagram Personality Types, Inc. He has been co-teaching the Enneagram Professional Training Programs since 1991, and is a founding director and former vice president of the International Enneagram Association. He is the co-author of The Wisdom of the Enneagram, Personality Types, Understanding the Enneagram, and Discovering Your Personality Type. He holds a degree in East Asian studies from Columbia University in New York, from which he graduated Phi Beta Kappa. 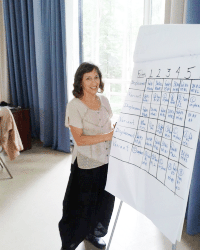 Deborah Rose Longo has been an instructor of the Gurdjieff Movements for over 35 years, working with groups in the United States, Germany, Australia, England, Chile, Canada, Italy, India, Russia, Ukraine and South Korea. 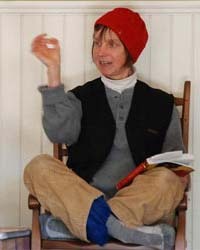 She began her training in the Gurdjieff Work and the Sacred Movements under the direction of Pierre and Vivien Elliott, (students of Gurdjieff), in 1975 at the Claymont Society for Continuous Education in Charles Town, West Virginia (founded by John Bennett), and has continued to be a long time Claymont community member. Deborah is also an artist specializing in mandala making, has had her work featured in numerous publications, and conducts mandala-making classes as a tool for helping participants connect positively with creative energy flow. For the past 12 years, she has also enjoyed the challenges of substitute teaching in the public school system as an opportunity to positively influence the lives of many young souls. Cynthia Bourgeault is the principal Teacher and Advisor to the Contemplative Society, an ecumenical, not-for-profit association that encourages a deepening of contemplative prayer based in the Christian tradition, and an adjunct faculty member at the Vancouver School of Theology. She is a retreat and conference leader, teacher of prayer, writer on the spiritual life, Episcopal priest, and part-time hermit, spending half of each year in solitude on Eagle Island in Maine. Cynthia is passionately committed to the recovery of the Christian contemplative path and has worked closely with Fr. Thomas Keating and others as a teacher of centering prayer, as well as in Sufism and the Christian inner traditions. She is the author of Chanting the Psalms, Mystical Hope, The Wisdom Way of Knowing, Centering Prayer and Inner Awakening, Love is Stronger Than Death, The Wisdom Jesus, The Meaning of Mary Magdalene, Holy Trinity and the Law of Three, and many articles and audio tapes on the contemplative life. She is a past Fellow of the Institute for Ecumenical and Cultural research at St. John's Abbey in Collegeville, MN, and an oblate of New Camaldoli Monastery in Big Sur, California. In 2001 she was invited to become a charter participant in the "Deepening the American Dream Project," sponsored by the Fetzer Institute, joining a select group of other American spiritual writers including Kathleen Norris, Jacob Needleman, Elaine Pagels, Huston Smith, and Parker Palmer. The Wisdom Way of Knowing: Reclaiming an Ancient Tradition to Awaken the Heart is a revision and expansion of the essay originally written for this project.